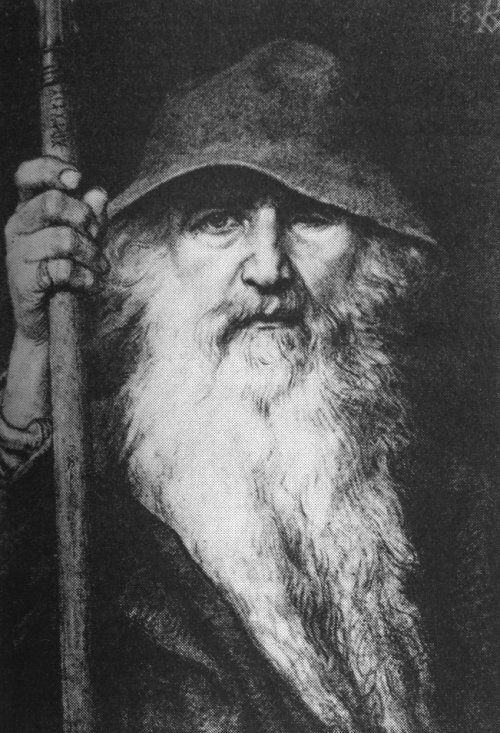 Norse Mythology for Smart People provides reliable, well-documented information on the enthralling mythology and religion of the Norse and other Germanic peoples. If that’s what you’re looking for, you’ve come to the right place. Before the Norse (a.k.a. the Vikings) converted to Christianity during the Middle Ages, they had their own vibrant native pagan religion that was as harshly beautiful as the Nordic landscape to which it was intimately connected. The centerpiece of that religion was what we today call “Norse mythology:” the set of religious stories that gave meaning to the Vikings’ lives. These myths revolved around gods and goddesses with fascinating and highly complex characters, such as Odin, Thor, Freya, and Loki. The Norse religion that contained these myths never had a true name – those who practiced it just called it “tradition.” However, people who continued to follow the old ways after the arrival of Christianity were sometimes called “heathens,” which originally meant simply “people who live on the heaths” or elsewhere in the countryside, and the name has stuck. Religions are attempts by mankind to reach the numinous, and the Norse religion was of course no exception. It provided a means of doing this that was fitting for the Vikings’ time and place. Even though some aspects of it may strike the modern reader as bizarre, if we approach it with the open mind it deserves, we can recognize within it the common human quest to live life in the presence of the transcendent majesty and joy of the sacred. And even though it’s been a thousand years since the last Vikings laid down their swords, people today continue to be inspired by the vitality and wonder of the Norse myths and the gods who inhabit them. For the Vikings, the world as they found it was enchanted – that is, they didn’t feel the need to seek salvation from the world, but instead delighted in, and marveled at, “the way things are,” including what we today would call both “nature” and “culture.” Their religion and myths didn’t sugarcoat the sordidness, strife, and unfairness of earthly life, but instead acknowledged it and praised the attempt to master it through the accomplishment of great deeds for the benefit of oneself and one’s people. A life full of such deeds was what “the good life” was for the Vikings. The Vikings were seafaring raiders, conquerors, explorers, settlers, and traders from modern-day Norway, Sweden, Denmark, and Iceland who ventured throughout much of the world during the Viking Age (roughly 793-1066 CE). They traveled as far east as Baghdad and as far west as North America, which they discovered some five hundred years before Christopher Columbus. They spoke the Old Norse language, wrote in runes, and practiced their ancestral religion. 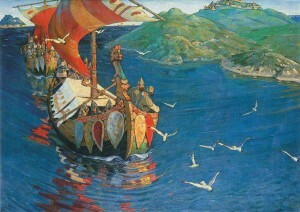 The Vikings were motivated to sail from their homelands by timeless, universal human desires: wealth, prestige, and power. As in most human societies, those aims were intertwined for the Vikings; those who had more wealth typically had more prestige and power, and vice versa. The Vikings sought wealth in both its portable form – gold, silver, gemstones, and the like – and in the form of land. 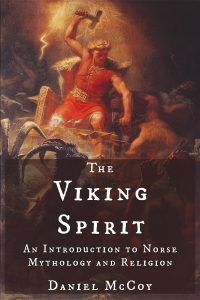 We have the Vikings to thank for our present understanding not only of their own pre-Christian religion and mythology, but of that of the other Germanic peoples as well. Thanks to the Old Norse poems, treatises, and sagas that were written during or relatively soon after the Viking Age, we have a much, much fuller picture of what the Vikings’ religion was like (despite the many unfortunate holes that nevertheless remain in that picture) than we do for the religions of any of the other pre-Christian Germanic peoples. But from the little that we do know about those religions directly, they seem to have been variations on common themes that were also shared by the Norse, so we can use the Norse sources to help us reconstruct those hoary religions, too. 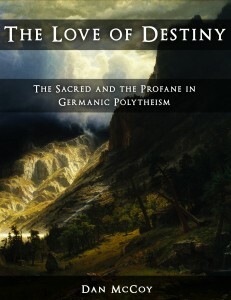 The Germanic peoples are one of the indigenous peoples of northern Europe, along with the Celts, Sami, Finns, and others. Historically, they’ve occupied much of Scandinavia, Iceland, the British Isles, and continental Europe north of the Alps. Their best-known representatives are the Vikings, the Anglo-Saxons, and the continental Germanic tribes, but they included many other groups as well. In the modern era, they – we – are spread out across the world. While there were certainly regional and temporal variations in the pre-Christian religion of the Germanic peoples, there was nevertheless a common core worldview, cosmology, and, to a large extent, a common pantheon as well. If you’re a person of northern European descent (including English, Scottish, German, and northern French descent), it’s a safe bet that you’ve got some Germanic blood in you. That means, in turn, that it’s a safe bet that some of your ancestors practiced something very close to the religion represented by Norse mythology. Of course, you very well may still find Norse/Germanic mythology to be fascinating and illuminating if you don’t have any Germanic in your ancestry. Mythologies are certainly expressions of a particular person or people, but they’re far from only that; there tends to be a spark of something more timeless and universal in them as well.